I have a Logitech headset. It only works on my Desktop, which is Windows 7. My laptop is also Windows 7 and can't seem to find what the problem is. My Desktop's Sound Driver is SigmaTel High Definition Audio Codec 6.10.0.5511 , my Laptop's is SigmaTel High Definition Codec 6.10.0.5866. I know I plugged it in correct port and the mute switch isn't set to mute. I am able to just switch to Desktop then it works then after I switch it to Laptop, it doesn't work. Well said, i can not find any weak spots to troll you. right click the speaker icon in the lower right-hand corner. 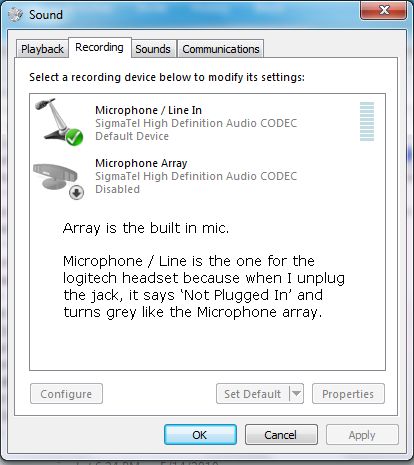 make sure your microphone is set to be the default device, and if necessary, disable the built-in mic. @Adam- Nope, didn't work. I've already tried that. Is it a jack (3.5 mm plug) or an USB headset? If it's a jack you could try if any other recording device works on it (old mic, ps2 singstar, jack - jack cable with music playing). Sgt Pepper wrote: Is it a jack (3.5 mm plug) or an USB headset? If it's a jack you could try if any other recording device works on it (old mic, ps2 singstar, jack - jack cable with music playing). @Chuck- What do you mean? Says an audio playback device can't be found or something like that. both of them dont work? have you updated the drivers? Audio playback device can't be found? Can you give us a screenshot? Sgt Pepper wrote: both of them dont work? have you updated the drivers? The array one works, which is the built-in one with the webcam of the laptop and yes drivers are up to date. 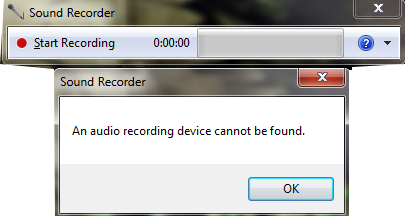 Lol my fault Eraser, I mean Audio Recording device not found. And how would you o_o . Google if you could give me or chuck access via teamviewer we could maybe help. I had win7 for 5 days i think and i also had a problem with my microphone. I remember that part was very confusing in win7 i had to change things in two locations i remember to get it working. Iron Man 2 id the BOMB! Its awesome! Cpt Jonesie wrote: Iron Man 2 id the BOMB! Its awesome! Its got a better story line to it. Well, I'm available atm so if anyone wants to do Teamviewer to help me fix it. Message me or chuck in steam if you see us online. Cpt Jonesie wrote: Its got a better story line to it. I'll be available most likely at 7PM GMT-5 or probably later like around 8PM or 9PM.